A country in western South America, Peru is bordered on the north by Ecuador and Colombia, on the east by Brazil, on the southeast by Bolivia, on the south by Chile, and on the west by the Pacific Ocean. The official flag of Peru was adopted in 1825 by the government of Peru. Peru flag is a vertical triband with red outer bands and a single white middle band. The first inhabitants of Peru is said to be that of hunter gatherers who lived in the caves of the coastal regions. The oldest dated discovered cave is that of the Pikimachay cave, which is said to have been inhabited in 12,000 BC. Archaeological evidence also shows that agriculture had existed in the region in as early as 4000 BC. In the early 15th century, the Inca Empire had dominated the region, extending to other countries such as Chile and Colombia. When the first Spanish explorer, in the name of Francisco Pizarro, arrived in the region in 1526, Peru already had its own cities and kingdoms. Pizarro went back to Spain to bring with him more men, and in 1533, returned to Peru and captured the Inca emperor Atahualpa, who he later executed. Pizarro eventually established the capital of Lima in 1535, but was killed in 1541. Spain had continued to conquer the region despite resistance from the Inca people. The last of the Inca rebellion came in 1572, with the beheading of Inca leader Manco Inca. The next 200 years of Spanish occupancy was peaceful in Peru, with the region becoming a major political, social, and commercial center. The fight for liberation from the Spanish rule came in 1812 through the Creole rebellion in Huanuco, followed by the Cuzco rebellion in 1814. Independence from Spain came on July 28, 1821, through the combined forces of Argentinean Jose de San Martin and Venezuelan Simon Bolivar. 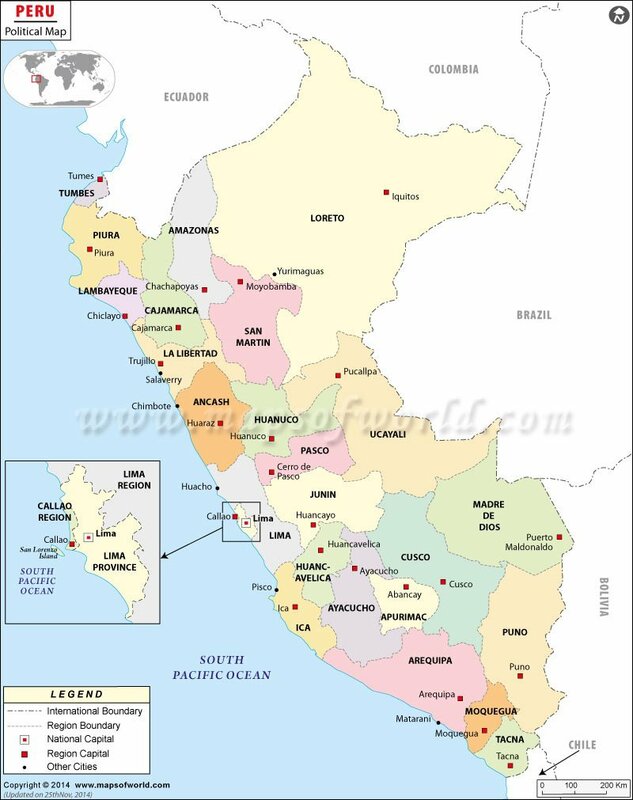 Peru is located in western South America, with coastlines on the Pacific Ocean. The borders of Peru include Ecuador and Colombia to the north, Brazil to the east, Bolivia to the southeast, and Chile to the south. The Pacific Ocean is found on the western area of Peru. Peru is defined by 3 regions: the west or costa, made of narrow plain and arid land; the highlands or sierra, which is the region of the Andes; and the jungle or selva, which is mostly covered by the Amazon rainforest and makes up more than 60% of the country's total land area. 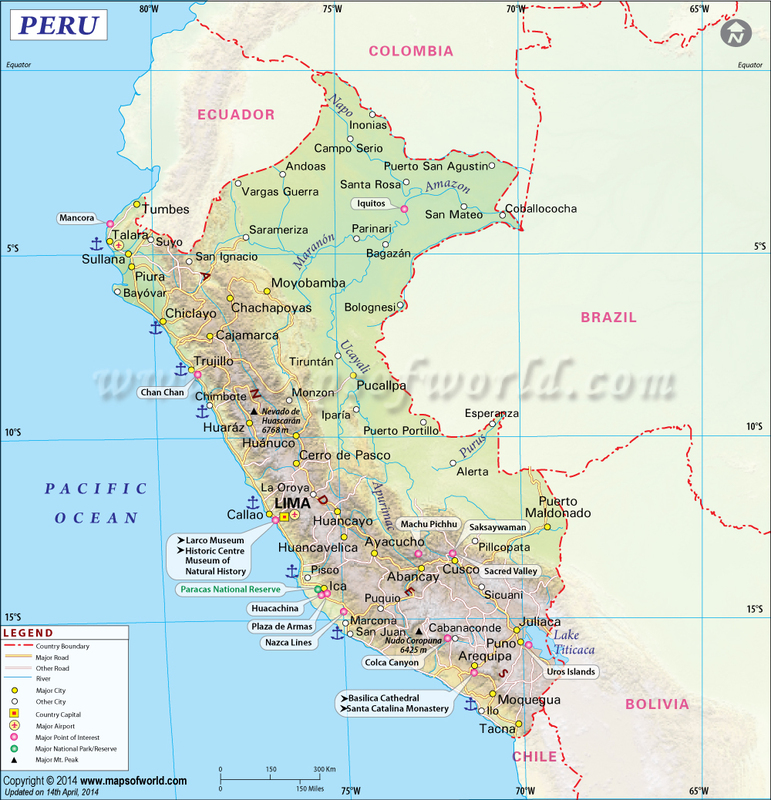 Peru is a representative democratic republic where the President is both Head of State and Head of Government. It is the President's responsibility to assign the Prime Minister, and that of the Council of Ministers. The President is also Commander in Chief of the nation's Armed Forces. Peru is divided into 25 regions, which each one of them having their elected government composed of a president and council that serve 4-year terms. Peru is one of the more popular travel destinations in South America, mainly because it is home to a number of pre-Columbian cultures. Know for being the hub of the Inca Empire, the most popular tourist attraction in the country is the famous Macchu Picchu. An architectural genius and included in the New Seven Wonders of the World in 2007, Macchu Picchu is one of the most beautiful ancient sites in the world. Invisible from below and situated at 7,972 feet in the Andes mountain top, it was only discovered in 1911 by Yale archaeologist Hiram Bingham. A city that is said to have been built in the 1400's, its impressive structures include palaces, baths, temples, and hundreds of houses. Peru is also known for being a surfer's paradise. The towns of Chicama and Mancora are world-famous for their incredible waves. Chicama is home to the world's longest left handed wave at 4km, while Mancora is home of the world's largest left handed point break. Mancora is also a popular tourist destination for having the best sandy beaches in the country, as well as having a thriving night scene. Colca Canyon is deeper than the United States' famous Grand Canyon. Located in the Andes mountain range, it is a popular site and destination for nature lovers. The Huacachina is an oasis town that surrounds a lake. The town is also surrounded by towering sand dunes that allow tourists to sand board and enjoy dune buggy rides. According to UNESCO and World Bank, Peru has the best education system of all of Latin America. Education in the initial, primary, and secondary levels are free and compulsory, while public universities are also free for students who can't afford to pay tuition and those who show adequate academic performance. The education is handled by the Ministry of Education, which was established in 1837. Peru has the 2nd largest area of land covered in rainforest in the world. 60% of the country's land is covered with the Amazon rainforest, coming only 2nd to Brazil. The potato is from Peru, with the country producing over 3000 known varieties of the crop. Peru also grows more than 55 varieties of corn. Peru is the 6th largest producer of gold in the world.